Raw pies are a favorite dessert around here. They are easy to prepare, they taste delicious, they are good for you, and you won’t feel guilty about eating them for breakfast the next morning. Why are they good for you? The ones that we make always contain raw nuts, usually contain raw fruit, and they never contain refined sugar. Crust: Process together nuts, a few dates, and a wee bit of agave in a food processor. The dates and agave sweeten it up a bit and make it all stick together. You can get creative with add-ins such as coconut, citrus zest, spices, etc. Once you’ve got your crust dough prepared, press into your pie or tart pan. Filling: This can be whatever you want, really. Sometimes I puree fruit, pour it into the crust, and then freeze it for a bit. Sometimes I slice up fruit, season it, and pour it into the crust. Sometimes I try something a little different, and that’s exactly what I did with this recipe. Cashews play a starring role in many raw recipes because of their creaminess when processed in a food processor with a few supporting characters. Soaking them for a few hours beforehand makes them even creamier. For the “cream” filling in this particular pie, I soaked the cashews in water for 2 hours and then mixed in orange and carob for flavor, agave for sweetness, and a touch of salt to help deepen the sweetness of the filling. I used carob powder because I like the toasted caramel flavor of it, but feel free to substitute cocoa powder instead. Process all ingredients in a food process until they get good and sticky and start to ball up. Press into tartlet molds and freeze for 20-30 minutes before filling. Place all ingredients in a food process and process until very smooth. 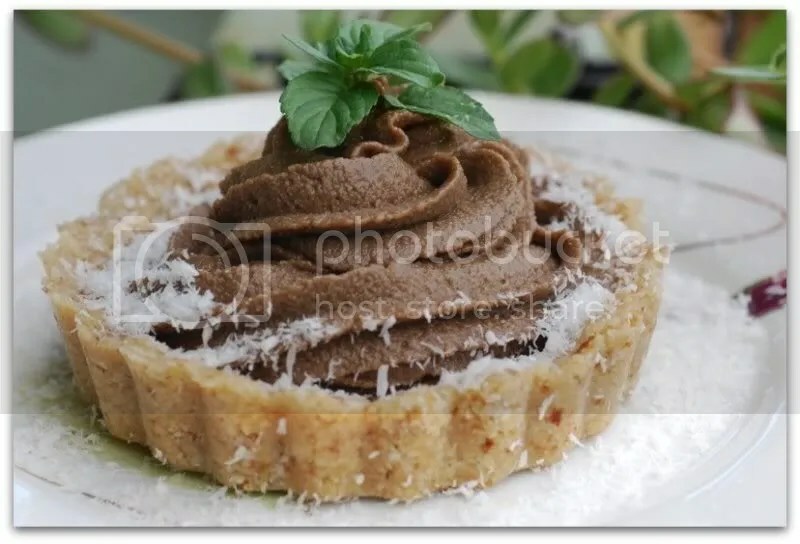 Spoon filling into tartlets, garnish with coconut flakes and mint leaves, and serve. These are stunning tartlets, and they sound absolutely delicious! 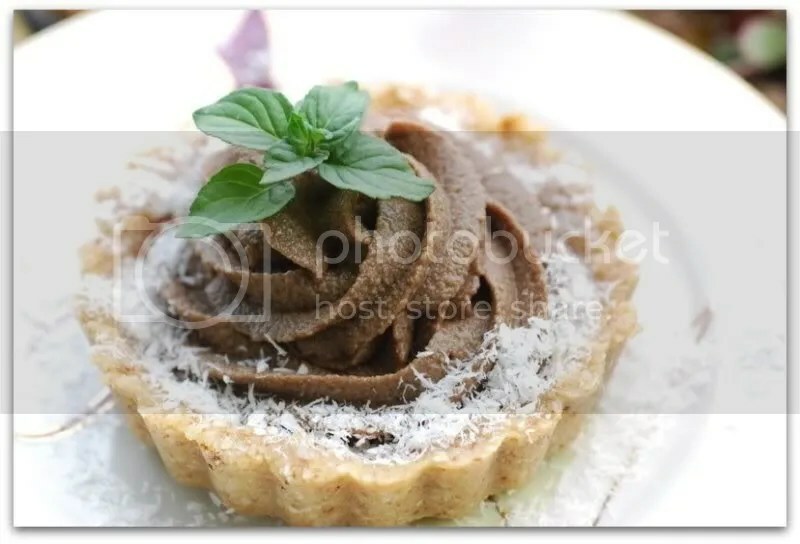 I’m amazed that’s a raw crust–the photo looks like any other pie crust! I cannot wait to try this out, as raw cashew-carob pudding is one of my favorites, and I’ve never tried it with orange! I love raw tarts/pies. They are a tasty dessert and like you said, they are also an awesome breakfast. 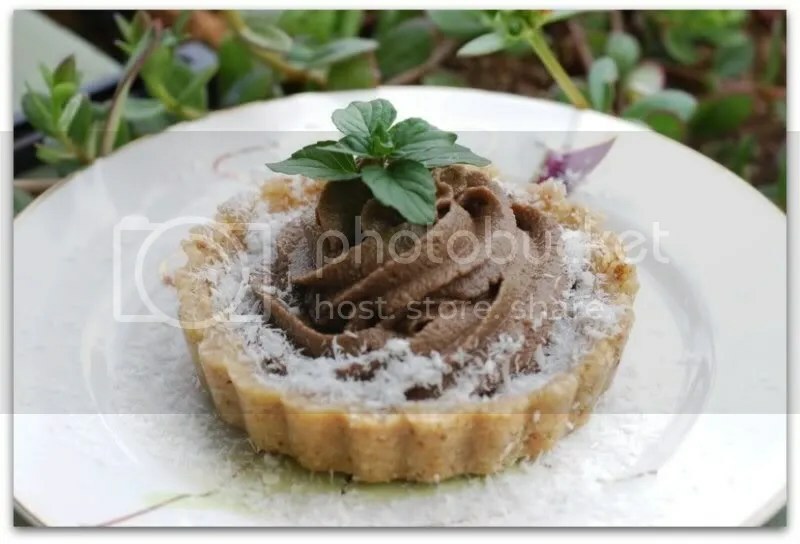 This tart look delicious! Chocolate and orange is such a great combination. Thanks for posting this recipe and thanks for your kind words. Oh and you forgot to mention how beautiful raw food looks! These are pretty and I am totally sold! This looks really delicious! I should try making a raw crust – seems a lot easier than making a cooked one! I never thought I’d be tempted by raw dessert, but that looks wonderful! These are so beautiful! I am so frustrated by the cost of cashews here…because they are so wonderful for raw foods, especially raw desserts! Your tarts look amazing! Thank you all for the kind comments! I hope that you all give these a try, and get creative – they are so versatile! I still can’t find agave anywhere so I used honey as a substitute. I think the flavor was too strong and it upset the carob orange balance. Add to my woes a crust that would not stick together for a second using the recipe measurements and you have one sad me that my tartlets were nothing like yours. Sigh. I will have to come eat at the Outpost. Jennifer – How sad! I hope that you still enjoyed eating your crumbly tart 🙂 Honey behaves differently than agave, in my opinion. If you have difficulty with this type of crust in the future, just add dates or agave or more honey – more sticky stuff will help!